Technical Training for Sales Reps Benefits Customers | Chemtrac, Inc.
We understand that our Chemtrac product sales are in a large part from the efforts of independent distributors and manufacturers representatives. These sales reps are often times the initial connection for us with the end user. So it is imperative that they develop the necessary expertise to effectively and accurately communicate the technology, features, and benefits, associated with the solutions we offer. The reps are a critical part of the Chemtrac team, and the more knowledge they have about our analyzers and applications, the better they will be able to serve our customers. We are committed to providing technical training for those who are selling our products. We periodically conduct hands-on training sessions at our new manufacturing facility in the Atlanta area. 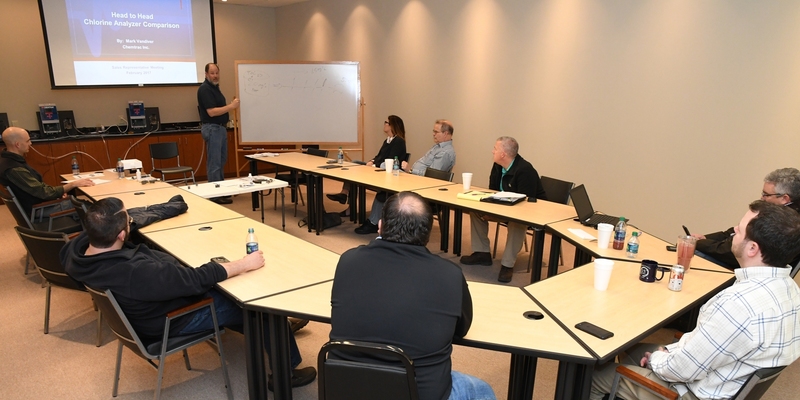 The training covers the products that we sell, the advantages that they offer, and the essentials related to proper installation, operation, and maintenance…all with the ultimate goal of helping our customers utilize our products to optimize their water treatment processes.